i Click 'view all' to instantly compare this good deal with offers on other top personalized name necklaces. 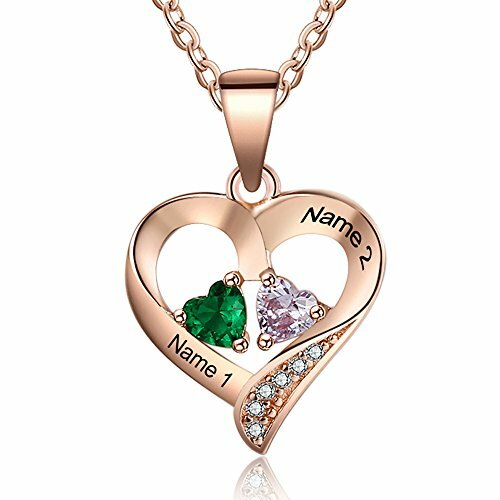 Love Jewelry Personalized 2 Names Necklace w/ 2 Heart Birthstones is currently selling at $30.88, approximately $0.65 lower than average, giving a potential saving of $2.00 right now. With a lowest price of $30.88 and an average of $31.53 it is selling on the low end of its usual range. Price volatility is 0.3% (meaning it does not change often), so the price should stay low for a while. Right now this product is a recommended 'good deal'. There is a coupon available for an additional 45% off. The current deal is also the best price on this item over the last month. 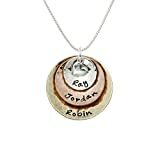 Compare the current price, savings (in dollars & percent) and Buy Ratings for the top Personalized Name Necklaces that are closely related to Love Jewelry Personalized 2 Names Necklace w/ 2 Heart Birthstones. Here is how Love Jewelry Personalized 2 Names Necklace w/ 2 Heart Birthstones compares with other leading Personalized Name Necklaces. Pendant Size: 16.5mm X 17mm Chain Length: 45 + 5cm (about 19.68'') Packing: Delicate Necklace Box + FREE Jewelry Polishing Cloth, READY to be a gift. ? Your Gift Advisor ·Are you looking for a personalized jewelry gift for your beloves? ·Do you need the most eye-catching piece of jewelry to match your outfits? ·Are you tired of those cheaply made jewelries that would break after a while? 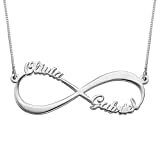 ·This custom name necklace must be your good choice. ?? Designed to be: ? Birthday necklace gifts ? Dating necklace ? Graduation necklace gifts ? Friendship necklace gifts ? Promise necklace ? Girlfriend necklace ? Wedding necklace gifts ? Mother necklace ? Daughter necklace ? Engagement necklace ? Christmas necklace gifts ? Valentines Day necklace ? Family necklace ? Daily-wear necklace ??? SHIPPING: Allow 2-3 days to have the ring customized. Standard shipping: Delivery time depends on where you are, normally it takes 7-10 business days After Shipping. Express Shipping: (4-6 business days After Shipping.) If you choose this shipping way, your Phone# is needed. ???? WHY LOVE JEWELRY? ? Fair Price ? Quality product ? Free Engravings ? Free Tracking Service ? 60-day Money Back & Defective Exchange Guarantee ? 1-Year Warranty Against Tarnish ???? 100% Satisfaction, it's just that simple. If you have any question, just click on the "Contact Seller" button or leave your question into "Customer Questions & Answers" . Features Customized Steps?1-Click on"Customize now"; 2-Type in Texts & Select Colors. DIY Options - You can DIY this heart cut women necklace with: 2 Simulated Birthstones + 2 Engraved Names. Gift Choices - This personalized necklace comes with a Delicate Ring Box + Jewelry Polishing Cloth, READY for Giving or Receiving. A wonderful gift for yourself, your lovers, your friends, your family or other people dear to you on birthday, party time, dating, graduation, wedding, mother's day, engagement, Christmas, valentine's day and any special date to you. Symbolics - Promise, Solidarity, Unshaken Love, Sweet Affection, Mutual Affinity, Together Forever.